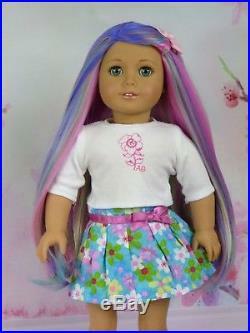 Meet Iris, the One of a Kind American Girl Rainbow Princess. 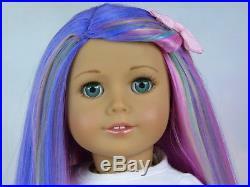 She was created from a gently preloved 18 American Girl Caroline doll. I have given her Marie Grace's beautiful aquamarine eyes. They open and close properly and have full eyelashes. Using acrylics and professional sealant, I have added delicate eyelashes, feathered eyebrows, iridescent glitter to her eyelids, blush, and pink shimmer with glitter gloss to her lips. 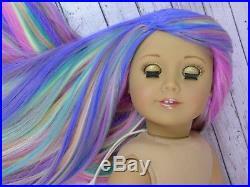 I have given her a soft, silky rainbow-colored wig. It has been permanently attached with waterproof craft contact adhesive, E6000. It can be heat styled and is tangle resistant. 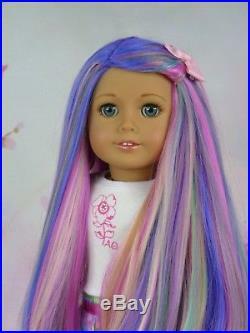 Just like an AG wig, it can be gently brushed, styled, and washed. I have customized this doll in my smoke-free, pet-free studio. She has been thoroughly cleaned and restrung. Her tight limbs are easily poseable. Her original neck strings are uncut. She will arrive wearing her gently used AG top and skirt. Her new white and gold star shoes are not AG brand. 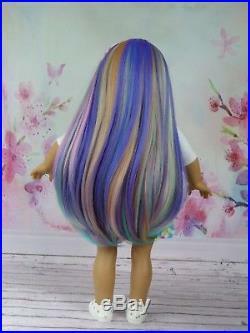 The item "OOAK Rainbow Princess American Girl 18 Doll Custom Hair Aqua Eyes" is in sale since Friday, July 20, 2018. 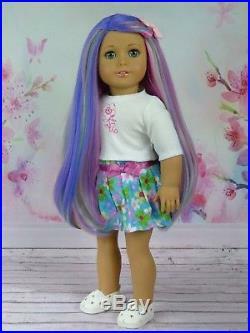 This item is in the category "Dolls & Bears\Dolls\By Brand, Company, Character\American Girl\Today & Other American Girl Dolls". The seller is "americandolldreams" and is located in Knoxville, Tennessee. This item can be shipped to United States.